Can Tempoyak Be A Popular Dish In The White House? BANGI, 4 March 2014 – Could the President of the United States one day be ordering tempoyak – the popular fermented durian paste used in certain curries and sambals – in the White House? That was among the challenges the Vice-Chancellor of The National University of Malaysia (UKM), Professor Datuk Dr Noor Azlan Ghazali presented to youths when he spoke in his lecture on Economic Transformation In the Context of Competitive Youths at a Conference of Youth Leadership here today. Prof Noor Azlan challenged them to use the science and innovation that they had learnt to turn their dreams into reality. If entrepreneurs in other countries can create products that become popular around the world, the new generation of Malaysian graduates also should realise innovations that could popularise traditional Malaysian foods. “Who knows. The President of the United States of America may one day order tempoyak for lunch,” he said with a tongue in the cheek. 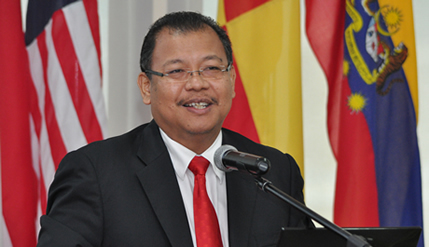 Prof Datuk Noor Azlan said university and secondary school students attending the conference should take up such challenges because they already have all the opportunities to find ways to make products that can become famous the world over. He said the scenario is not impossible because he had seen dodol from Melaka being sold in Boston, Massachusetts with pretty packaging in fancy shops. “So youths should be creative and why not market tempoyak as a jam or spread for breakfast,” he added . He believes it is possible for tempoyak to become popular even in the White House one day if young Malaysian entrepreneurs really try hard enough. They must have a globalised outlook and be action minded . Prof Noor Azlan cited the example of Japanese farmers who were successful in growing fruits that made the rest of the world sit up and take notice. “Nobody thought it was possible to grow square watermelons or in the shape of a heart, but they did it,” he noted. He urged students to stand out from the rest of the crowd. The youth leadership conference was organised jointly by UKM and the Cheras Education Foundation (Yayasan Pendidikan Cheras). Minister of Youth and Sports, Khairy Jamaluddin Abu Bakar and UKM Political Science lecturer Associate Professor Datuk Dr Mohammad Agus Yusof took part in the conference.